The Longere is one of the properties making up La Cerisaie along with The Etable. it is a spacious 3-bedroomed farmhouse with many period features offering quality, flexible accommodation. It can sleep 8 people - 6 in 3 double bedrooms plus 2 on single chair beds. There is plenty of parking and garden/patio space. La Cerisaie is ideally situated just 40-50kms between Le Mans, Tours and Saumur. La Cerisaie is very rural but with lovely walks. En suite shower room and wc to master bedroom. Family bathroom with separate bath, shower and wc. Kitchen/Dining area has double Belfast-style sink, freestanding cooker (gas hob/electric oven), 1 integrated drawer fridge, 1 larder fridge, dishwasher, dining table and 8 chairs. Utility room has double Belfast-style sink, washing machine, microwave, airer, iron and ironing board. Focal point of the spacious sitting room is the wood burning stove and bread oven. UK TV. Playroom has football table, dartboard, books, games. A high chair, stair gate and a travel cot are available, but guests must bring their own cot bedding and baby towels. Outside is a large patio with table, chairs, umbrella, loungers and a charcoal barbecue as well as a large lawned area. toilet, shower, this is the ensuite to the black and grey room. 6GB per week allowance in rental fee. More can be bought if needed. Monitored. Small starter amount of tea, coffee and sugar provided as well as a bottle of fresh milk in fridge. There is a paddling pool stored in the utility room. 2 local courses - a 9 hole course at Clefs de Pins suitable for beginners and Golfe Bauge, one of the top courses in France. Golfe Bauge has a lovely restaurant - great value for money, great food. Notes on accommodation: Owing to the configuration of the The Longere, access to the Grey Room is via its own staircase from the kitchen and therefore it is not possible to get from it to the other bedrooms without coming down into the kitchen and using the the staircase in the hall. If you are coming with small children, we suggest you ask for the Teal and Lime rooms so that you are all together. We're sorry, but no pets allowed. Freshly laundered towels and linen are provided on arrival (other than for the travel cot). There are facilities for guests to do laundry during their stay if they wish. Outside: To the front of the houses there is ample parking as well as a large lawned area.. At the rear of The Longere there is a good sized lawned area and a large patio with table, chairs, umbrella, loungers and a charcoal barbecue. The Longere is a great house - even though we had read the other reviews we were still amazed at how big it is! The house is kept spotlessly clean, well maintained and it is well equipped. There were lots of little extras provided by the owners and we felt welcome as soon as we stepped inside. The house is very comfortable and, importantly for anyone like us visiting during a chilly April, very warm thanks to underfloor heating on the ground floor. The games room was a great bonus. The location is very peaceful with horses in a field across from the house and pheasants wandering through the garden in the evening yet the town of Le Lude is only a 10 minute drive away. We ventured further afield during our week at the Longere and visited lots of great places within about an hour’s drive. Our favourites were the chateaux of Chambord and Chenonceau, the town of Loches and the gardens at Villandry. This is one of the best houses we have stayed in and is highly recommended. Thank you Min! Thank you very much for the lovely review - so pleased you enjoyed your time in and around The Longere! La Longere was even better than we expected it to be. The accommodation was so homely and comfortable, with bags of space. Everything was spotlessly clean when we arrived. Kitchen, living room and games room all extremely well equipped. Everything had been thought about carefully and we felt as if we were home from home. The surrounding countryside was so peaceful and we spent many evenings watching the sun go down over the field while sipping our wine. Lots of lovely long walks around the country lanes. The local town of Le Lude was only 5 minutes away by car and had everything we needed re: shopping. Great night at Le Lude chateau on eve of Bastille Day - fantastic atmosphere. Lots of excursions from the house. We especially enjoyed Mini Chateaux Park and even made it to Paris for a day trip on the TGV - well worth the effort!!! and lovely to come back that night to the peace and quiet of La Longere. Thanks to Min and Chris for all their hard work restoring the properties. Without doubt one of the best properties we have ever stayed in. We will definitely be back. Such happy memories of summer 2016. We enjoyed a wonderful week here. The house is large as is the garden so plenty of space for a family inside and out. The house is also very clean and very well equipped. Le Lude itself has everything that you need patisseries, good eateries and even it's own chateau. There was a wide variety of things to do, we visited many chateaux: Chateau Villandry is stunning, while Chateau Langeais was more child friendly with tree houses for the children to explore and Chateau Usse is the inspiration for Sleeping Beauty and my daughter loved following the story there. We also had a fun day out at Mini Chateaux where the children could dress up in costumes provided - a big hit. Other days out included Le Mans, the 'beach' at La Fleche and a boat trip on the Loire. There were other things we wanted to do that we didn't have time for, so we'll be back! We would highly recommend a holiday here. We had a lovely week here in the Loire Valley. The house is beautiful and so spacious - couldn't have asked for more. Big garden too, perfect for French cricket or petanque!! We loved the location - near enough to towns/cities but remote enough that you have to drive past/through sunflower fields to get there!! There was plenty to keep the kids occupied at the house (games, books, TV etc) whilst we planned our days out. We visited some lovely Chateaux (Chateau Villandry has lovely grounds - Google it!!) and even spent a day at the "beach" in La Fleche - it's a man made white-sand beach on a lake - beautiful. Le Lude (the nearby town) is lovely and we had some great food there. Walking round the grounds of Chateau Le Lude was a favourite of ours - the big swing in the tall tree a favourite of the kids!! Didn't quite manage to get a round of golf in at the nearby course - maybe next time!! All in all, very much recommended - we will be back for sure. The house came into view as we turned the corner of the field full of swaying sunflowers. Dad is all that our house? Not only is the house huge but also beautifully furnished and has everything for the perfect holiday. We stayed for two weeks and didn't seem to scrape the surface of the abundance of activities in the area. Canoeing down the river past beautiful Châteaux and cycling through local villages on well signposted cycle tracks to secluded picnic spots by the river. (Bikes and canoes available to hire at the camp site in La Lude). We thought the lack of a pool may be a problem but the lovely man made beach at La Fleche, 25 minutes away, provided a great day out on more than one occasion. When we didn't want to travel that far the outdoor pool in La Lude, only 10 minutes away, with spacious grounds and a slide for the kids, was perfect for relaxing. Horse riding is available within a 5 minute walk. The owners will be more than happy to pass on their recommendations for the varied restaurants in La Lude. 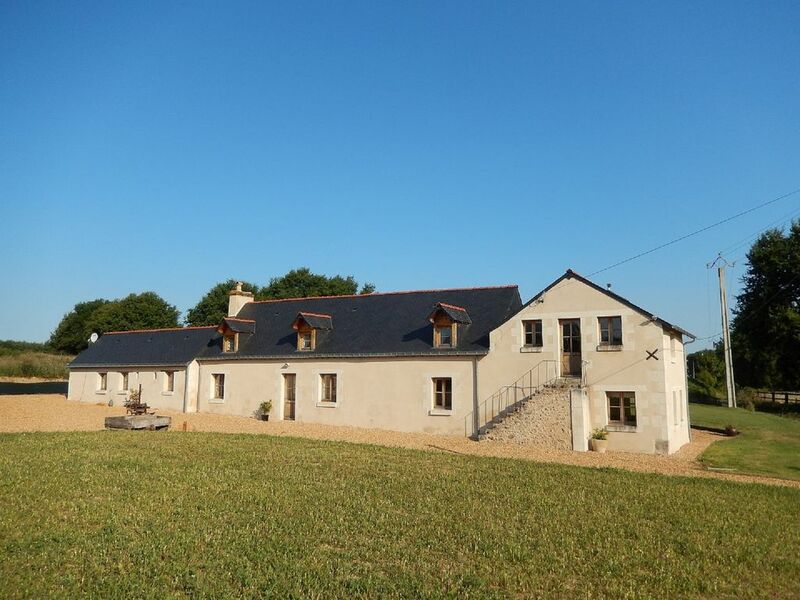 The property is secluded enough to enjoy the peace and tranquillity of the beautiful countryside yet close enough to the small town of La Lude to get everything you need. Thank you for a memorable holiday, we will be back to see what else the area has to offer. The south Brittany coast is about two and a half hours drive, but there are several man-made beaches nearby such as La Monnerie at La Fleche about 20kms away and Lac de Rille between Tours and Saumur. Driving - Calais 5 hours, Le Tunnel 4.5 hours, Caen 2.5 hours and Le Havre 3 hours. Nearest airport is Tours (40kms) and Nantes, Paris Orly and Poitiers airports are all 2 1/2 hours away. There are train stations in Tours and Le Mans. Car is essential. La Cerisaie is 40+kms between Le Mans, Tours and Saumur. Nearest village (Broc) is 4km away and nearest town (Le Lude) is 8kms away. There’s plenty to do in the area with something for everyone – Le Mans for the motor racing, beautiful chateaux, vineyards, cycling, activity parks, museums, wonderful forests, golf courses, horse riding, donkey trekking - and much more. Broc village has a small basic village shop/bread station, church and Mairie, whilst Le Lude has supermarkets, banks, pharmacies and restaurants. Booking Notes: A £200 deposit is required to confirm the booking. A £200 refundable security deposit is required when the balance is paid. A discount of £100 is applied if both properties booked together.